Media and readers of my articles about atomic bombs 1945, moon trips 1969, M/S Estonia ferry incident 1994 and 911 tower top down terrorist collapses 2001 are warned. You probably suffer from cognitive dissonance and cannot handle my information without getting mentally disturbed with serious consequences. My proven facts are simple and correct and good news. A-bombs do not work. Humans cannot travel to the Moon. M/S Estonia didn't lose her bow visor. Skyscrapers do not collapse from top down. All information to the contrary is pseudoscience, propaganda lies or fantasies promoted by media and taught at universities. And if you do not agree with the official lies, you will not be allowed at the university boat race* and other silly events, etc. Your position in society is at risk. If you suffer from cognitive dissonance, you no doubt find my info disturbing and get upset, angry, anxious or worried. What to believe and write? Old lies or truth? 11 September 2017 it was sixteen years since US terrorists destroyed the complete WTC-complex at New York 'live on (faked) TV' and blamed it, without evidence, on another party - Usama Bin Laden and al-Qaeda - some Arabs hiding in a cave somewhere. No structure or tower can be destroyed by gravity from above initiated by local structural failures up top caused, e.g. by a plane and fire. It is further explained at 1.18.50 in DVD2 - a film about the 911 incident. In order to fool the public the US terrorists asked (1) Hollywood to produce a movie showing the WTC towers being stricken by planes and collapsing (sic) progressively by gravity from top down, etc, that the US terrorists then (2) broadcasted 'live on TV' assisted by US media. 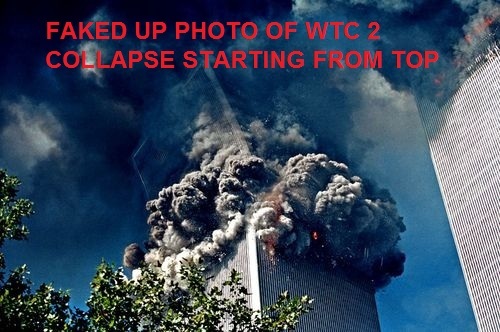 Photo by Thomas Nilsson - The above initiation of the destruction of WTC2 on 911, i.e. top part tilting and dropping, smoke and debris being ejected, etc., is not possible because structures cannot break down like that ... by gravity. The photo, incl. tree in front, building right, smoke glued to a tilting top in center, etc, is a fake (produced in Hollywood). Thomas Nilsson should be detained as a covered person! As the rubble would reveal how the towers really were destroyed the area was fenced off and faked pictures of the rubble itself were also made and published. Many persons get very upset of the thought that all footage of the 9/11 NY WTC destructions are fake. These persons must like the Anders Björkman Challenge! The Federal Bureau of Investigation, FBI, is also supporting the US terrorists and will not, after several contacts, review the below information. I have asked them several times. In the decade since the 9/11 attacks, the FBI's intelligence program has tripled in size, and FBI analysts work around the world - from the war zone in Afghanistan to the White House Situation Room - covering up the Truth about 911. No structure or tower can be destroyed by gravity from top down initiated by local structural failures up top, i.e. that the weak top crushes the strong bottom. The above picture has been made by a scientist suggesting weak tops of any structure crushes the bottoms of same structure keeping the tops up. This person should be detained as a covered person! The FBI has miserably failed the Anders Björkman Challenge 1. Dave Thomas of NMSR, Albuquerque, NM, a dull desert town which looks bankrupt, thought he could win the Challenge after I made a presentation there but failed completely and miserably. Dave thinks that dropping one bag C of rice on a kitchen scale (WTC) or on 9 bags A of rice will crush the scale (WTC) or the 9 bags A of rice, while the bag C, evidently, just bounced on the scale or on the 9 bags A, because the scale or A applied exactly the same impact force on the bag C of rice that the bag C of rice applied on the scale or A, when impact contact occurred. Dave does not understand that the impact force is of very short duration and the energy content is only that of the released potential energy that cannot even buckle the top of a kitchen scale or demolish a grain of rice in a bag of rice. What happens is that the impact force is transmitted to ground, while the scale/structure in between is elastically compressed. An identical impact force is applied to the moving top (or bag of rice) that is likewise elastically compressed (actually friction between the rice corns absorbs all the energy) during the short duration of the impact. 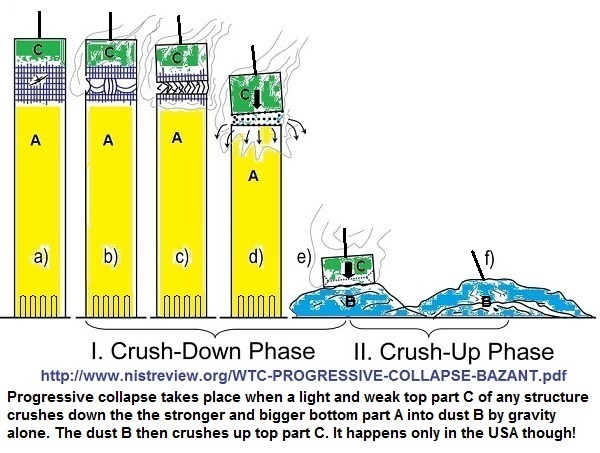 Dave shows in the second part of his paper an animation of one WTC tower destruction, where the tower itself is erased manually and smoke and debris are added - it look like a fountain. It is a simple trick film prepared in advance to be broadcast live on TV to brainwash the US population that believes anything shown on TV. The towers were in the meantime destroyed from bottom up. Try to crush a kitchen scale (WTC) with the top of another kitchen scale (WTC) to start with ... and note that the top just bounces off the scale, as expected, unless the scale crushes the little top of the scale at impact. I have asked Dave several times to drop a bag C of rice on 9 bags A of rice to destroy the nine bags A of rice and invite media to have a look but ... John Geohegan also of NMSR thinks one mass impacting one, two, three masses attached to a rod is the solution but forgets that the rod and the masses remain intact. Only some tooth picks broke. The Anders Björkman Challenge 1 has been open since March 2010 and there is still - May 2017 - 84 months and 60.000+ downloads of this page later - no successful Challenger/structure! The prize is € 1 000 000:-. Come on terrorists and salary slaves! And why not US President B. Obama himself. Show that you are really smart and and competent can destroy strong skyscrapers' bottoms and similar structures by flying light aluminium planes into the weak tops of steel and concrete. Do not try to fool me with fake animations 'live on TV'! And do not tell me that USA (1st May 2011) killed a man that did it 9+ years ago! Prove it in a legal court and do not kill people without trial. Both Obama and Osama have failed the Anders Björkman Challenge 1! The US terrorists are still free and around in USA to attack again. While FBI sleeps. Click here - Anders Björkman Challenge 1 - for details about it. The Anders Björkman Challenge 2 about a trip in space with humans aboard to the Moon and planet Mars with a safe return on Earth, Anders Björkman Challenge 3 about how to produce steam and/or electric energy by fusion, Anders Björkman Challenge 4 about atomic bombs or what they are (dummies?) and Anders Björkman Challenge 5 about how to knock off a bow visor from a ropax ferry without anybody noticing, are described at other web pages. Just click on the links above. The 911-report and the CIA Torture report written by members of the U.S. Congress can be read free of charge on the net. I review the reports here where you also can download the reports. Interesting reading. One President of the U.S. encouraged the CIA to use torture to find out how terrorists are brainwashed and another President of the U.S. ordered the terrorist to be murdered!